The Mob Museum provides a world-class, interactive journey through true stories. From the birth of the Mob, to today's headlines. Shadows and whispers. G-Men and Made Men. Whether you like it or not, this is American history. The Mob Museum presents unbelievable stories about the Mob, its impact on Las Vegas history and unique imprint on the world. True stories of Mob history are brought to life in an eye-opening style via interactive exhibits, high-tech theater presentations and nearly 1,000 authentic artifacts, the largest collection of Mob and law enforcement memorabilia under one roof. You've heard their names, you've maybe even heard their crimes, but you've never heard their whole story. The true story. The Mob Museum exposes fact from fiction and sheds light on how the Mob came to be, the battles that were fought, and what remains today. You'll learn about the Mob's biggest players including Al Capone, Whitey Bulger, Bugsy Siegel, John Gotti and many more. 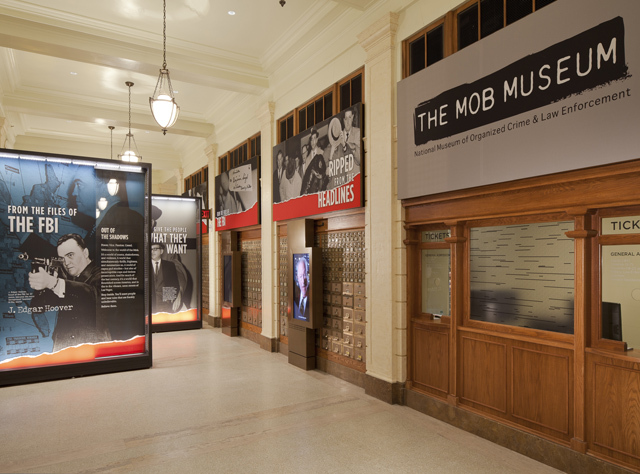 Since opening in 2012, The Mob Museum has accumulated numerous accolades, including being named one of the "Best Places to Travel in 2015" by Travel + Leisure Magazine, "A Must for Travelers" by The New York Times, one of "20 Places Every American Should See" by Fox News and Budget Travel magazine, "Las Vegas' Best New Attractions for 2012" by Travel + Leisure magazine, "9 Reasons to Visit Las Vegas" by CNNgo, a finalist for the "Best Wider World Project Award," by the British Guild of Travel Writers and "Best Museum" by Nevada Magazine. Get great low-priced tickets to the Mob Museum from VEGAS (the app) today!